At the end of Term 1 we had a wonderful display about our topic “Families Past and Present”. We were very lucky to have grandparents and great grandparents come and talk to us about the past and to bring in some very interesting objects to view. The children learnt about how things have changed dramatically from when their grandparents were children. Also late in Term 1 we worked very hard for Harmony Day. This is when we recognise that people come from different countries and cultures from around the world and that we are all different in some way. We had students who had connections with England so we made a display of English icons. The children really enjoyed working as part of a team and making decisions as a group. They put a lot of effort constructing their buses, castles, towers, Paddington bears, Stonehenge and other English icons. Well done 1/2M. 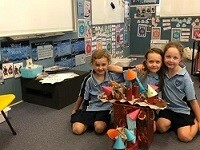 Image: Students made castles of England. Image: Students made a London red bus. Image: Students made Big Ben.